This entry was posted on February 5, 2015 by Phoebe Darqueling. It was filed under Books, Graphic Novels and Adaptations, Entertainment and was tagged with Alexia Tarrabotti, Book Reviews, Books, gail carriger, Parasol Protectorate, steam punk, Steampunk. I really like the sound of the premise for this book. Drat it though, now I’d rather be reading this than working on my dissertation. Then again I’m already procrastinating on WordPress so perhaps procrastinating with a book isn’t any worse. Haha, perhaps I should, but I’ve already got a currently-reading stack taller than me. I turned away from uni to finish The Madness Underneath last night just so it would look one book less inviting. 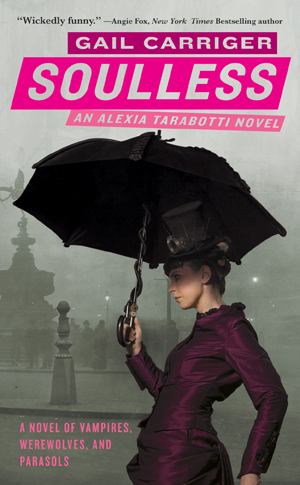 I just finished Soulless and Changeless. I found them both fun and generally entertaining. These were the second and third books I have read by Gail Carriger. I found the characters compelling and the language very fun. She has defined a very interesting world and culture with lots of complex rules that are being revealed over time. My only criticism (having read a third book) was that her stories seem a bit “Steampunk formululaic” – Set story in Victorian times, simmer language, throw in a cup of magical beasts and a dash of mechanical strangeness – stir thoroughly. Stated more clearly – it feels as if she started with Steampunk and wrote a story instead of starting with a story and made it Steampunk. It is a minor criticism that took three books to get to.